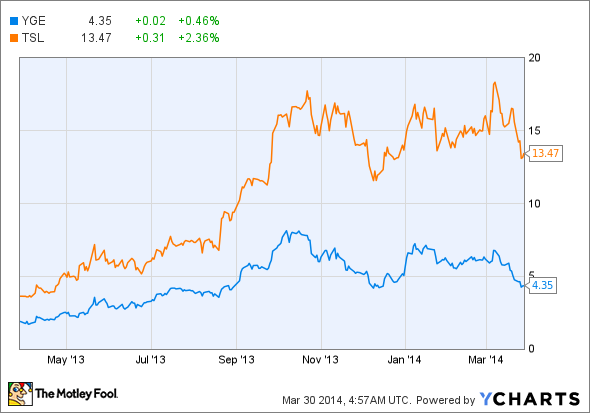 Better Buy: Yingli Green Energy or Trina Solar? Trina lags Yingli in PV module shipments, but don't let that stop you from picking up shares. With so many names to choose from among solar companies, investors may find it difficult to choose one. Yingli Green Energy (NYSE:YGE) and Trina Solar (NYSE:TSL) are two industry leaders that performed well in 2013. However, for 2014 and beyond I believe Trina Solar is the better choice -- with its shares down 28% from their 52-week high, now may be the right time to get in. According to NPD Solarbuzz, for the second year in a row Yingli claimed first place in the Top-10 list of module suppliers; Trina, moving up one spot from 2012, came in second. With shipments of 3,234.3 MW of PV modules in 2013, Yingli's deliveries represented a 40.8% increase year over year. However, Trina was the better growth story -- its 2,584.3 MW of shipments represented a 62.2% year-over-year increase. While it grew its shipments at a better clip than Yingli, Trina has outperformed its peer by a number of other metrics as well. Even though Yingli clearly leads when it comes to module shipments, that doesn't mean that it's more profitable than Trina Solar. In fact, Yingli's efforts to capture market share have come at what seems to be too great a cost. As of December 31, 2013, Yingli's total liabilities totaled $4.16 billion -- so it failed to improve on its $3.68 billion total as of December 31, 2012. Consequently, total shareholders' equity during the same period plummeted from $677 million to $351 million for this past year. Trina's books tell a much different story. Its total liabilities as of December 31, 2012 totaled $1.98 billion, but unlike Yingli Trina was able to improve on this as it reduced its liabilities to $1.74 billion. Like Yingli, Trina's total shareholders' equity also dropped, but the drop wasn't nearly as dramatic -- from $882 million at the end of 2012 to $822 million at the end of 2013. All of this translates into one startling fact: Yingli's debt-to-equity ratio, at the end of 2013, was a sky-high 11.83. Trina's ratio, on the other hand, was a much more reasonable 2.12. Taking on more debt isn't always a bad thing -- it's clearly a worthwhile move if it translates into increased module shipments. In this situation, though, Trina wins in this round as it delivered greater growth in module shipments, year over year, while it maintained a much better handle on its debt. In terms of the future, Trina is looking to grow and expand its production capacity while still keeping a close eye on its debt. In February, the company announced that it is acquiring a majority stake in Hubei Hongyuan, a specialized PV cell producer in Hubei Province. Management touts the value in the deal as it "will provide Trina Solar with the benefit of greater access to solar cell manufacturing capacity and at a low cost of capital." When it comes to margins, let's take a look at how both companies perform. In terms of gross margins, Trina improved from 4.4% in 2012 to 12.3% in 2013; Yingli's gross margin improved from -3.2% in 2012 to 10.9% in 2013. In terms of operating margin, Trina improved from -20.4% in 2012 to -2.1% in 2013; Yingli's operating margin improved from -22.2% in 2012 to -8.3% in 2013. Trina wins on both accounts. When it comes to profitability in 2013, neither Yingli nor Trina was in the black; however, Trina's performance inspires much more confidence. For the last two quarters, Trina has been increasingly profitable while Yingli has taken bigger losses; moreover, in terms of its fiscal year 2013 performance in comparison with that of 2012, Trina has made greater strides toward becoming profitable than Yingli has. The table below shows the diluted EPS for each company. There are lots of opportunities for investment in the solar industry -- opting to go with a PV module manufacturer is just one way to go about it. When looking at Chinese PV manufacturers, one of the most important things to consider is the amount of debt the companies carry -- just ask LDK Solar, one of the more recent victims of bankruptcy. For this reason (and a number of others) I think there's no doubt that Trina offers the more compelling thesis for investment.